Well here I am with another fun and easy Helmar project. This time I am sharing how you can get more out of your Helmar Acid free glue. I have ALWAYS loved those clear looking droplets of colour for boy layouts as what I call ‘boy bling’. I have since gotten to creating my own allowing me to be more in control of how big they are. I absolutely love them for water layouts too, and well in this one I have brought the two of them together! If you would like to know how I created these glue droplets, head over to my post 'Splish Splash wth a little bit of Helmar Acid Free' over at the Helmar DT Blog. I have provided step by step instructions with pictures. 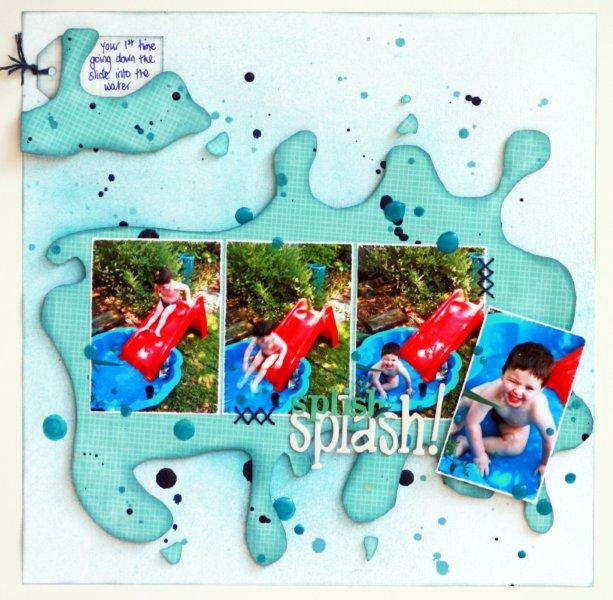 To create the layout I have also used some Liquid Scrap dots to lift the ‘splash’ created out of the patterned paper. I hope you enjoyed my share today and have a go at creating these yourself. When I just finished a project with my beloved Helmar Crackle I am always asked how it works SO I have decided to run a little demo tomorrow night over at Scraphaven. The demo will run for about 10 minutes and will commence tomorrow night promptly at 6:45pm. Along with the demo, Di will be having a pre-order special on the Helmar Step 1 and 2 Crackle at $5.50 each. This is over a dollar off the recommended retail price! There are still a couple of spots available in my noodle box class, but be quick as there isn't much time left to book in. 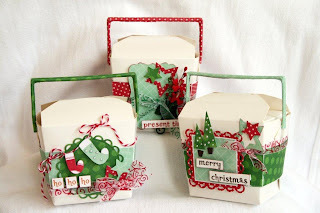 Come and join me for a little fun getting into the spirit of Christmas with these little Noodle Boxes. 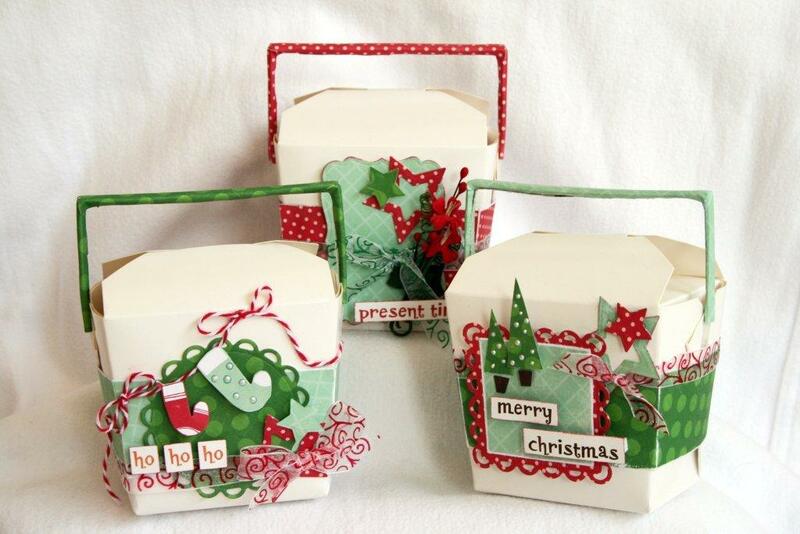 We will decorate 3 Noodle boxes ready for some yummy chocolates. They will make great Teacher's gifts or that little something you would like to take to a host of a Christmas party you may be attending. In any case, they will be ready to go at the end of the class! The class will be held at Scraphaven which is located in Sunbury Victoria on Friday 25th November at 7:30pm and will run for approximately 2 hours. Create @ Home Kit 5 at Tomorrow's Memories. I was asked to design the projects for Tomorrow’s Memories Create @ Home Kit 5 which is now out and I’ve been told selling quick. I am so pleased to hear that everyone is loving the layouts I created with the step by step instructions (for one and brief instructions for the second) that they can create in their very own home. 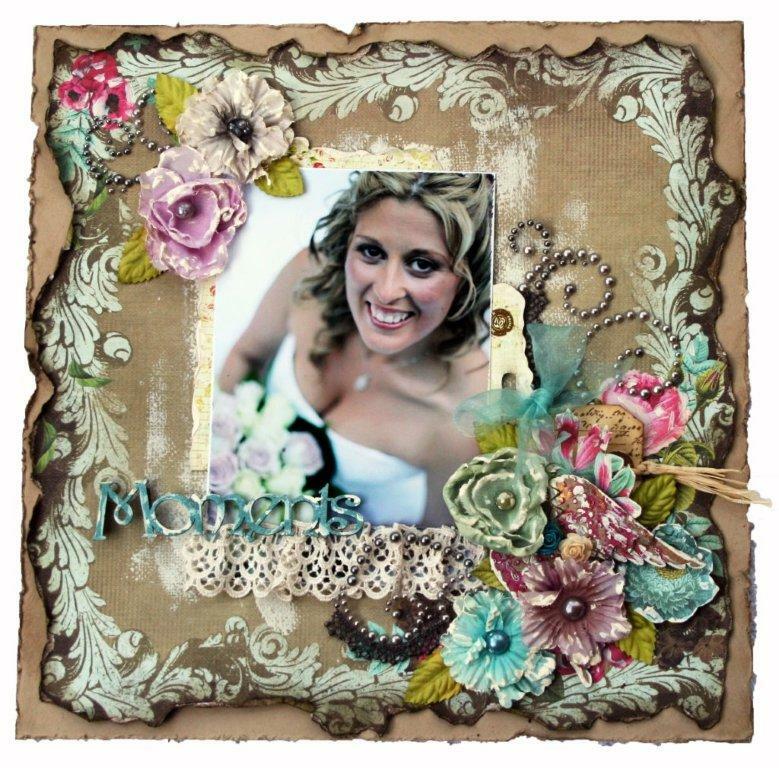 The kit includes EVERYTHING from beautiful papers, co-ordinating cardstock to beautiful flowers, trims and embellishments. 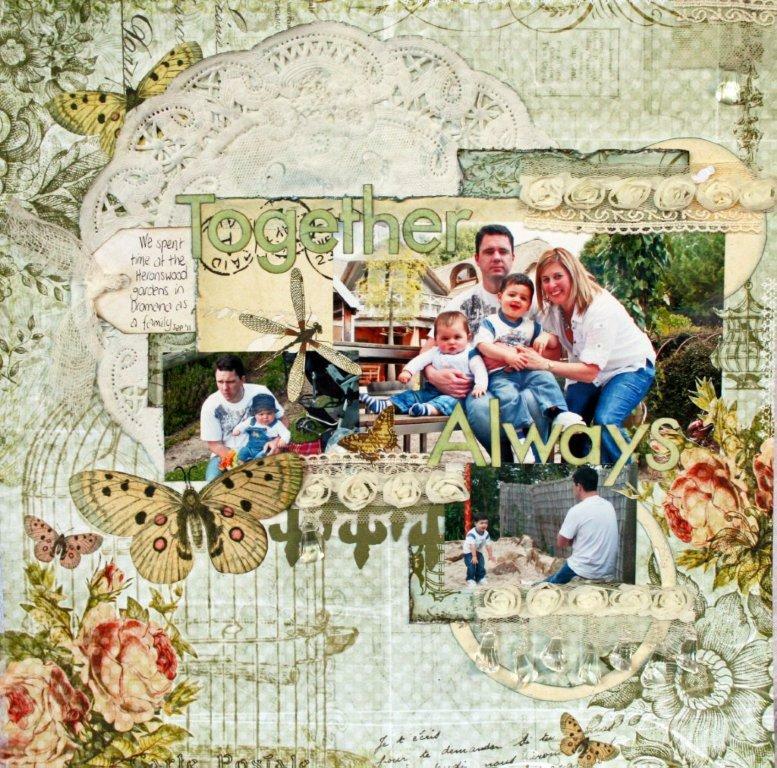 This kit EVEN has an acrylic stamp which can be used on SO many other projects as it is very versatile. Here are pictures of the layouts I created. The first is a layout of me and the boys that I had a friend take to surprise my hubby for father’s day. The colours were perfect to go with this paper range. The second layout is from a photo I took on timer mode on the camera when we went out for the day as a family. It is the norm for us to get out and do something with the kids on the weekend, and this photo is a great memory from our day out. 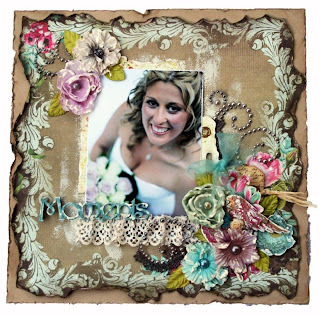 I hope you have enjoyed a peek at the layouts I created, and if you would like to have a play with the kit and re-create my layouts or tinker with them yourself, head on over to Tomorrow’s Memories Create @Home page to order your kit. The kits are limited numbers, and this kit sold 10 in just a couple of days without any advertising, so you will want to get in quick with this one! I am SOOO excited to be able to let the cat out of the bag (well have been for a couple of days now) that I have made the Helmar Design team for another term. I am really excited to be able to continue to share my Helmar uses with all of the followers, and continue to promote 'in an official' way (I don't think I would ever stop promoting Helmar products - on the team or not!!). So stay tuned for another 6 months of my Helmar Blog posts and competition shares!! You can check out the list of awesomely talented ladies that have also made the team by heading over to the DT Blog on the official blog post here. While you are there, check out the challenge for November by clicking here the challenge is another beautiful sketch by Lydell and here is my take on it. Just a quick share from me today. The other week I got the opportunity to teach at Scraphaven's annual retreat. I was really pleased when Di asked me to teach the class, and I really wanted to create something a little extra special for them to create. 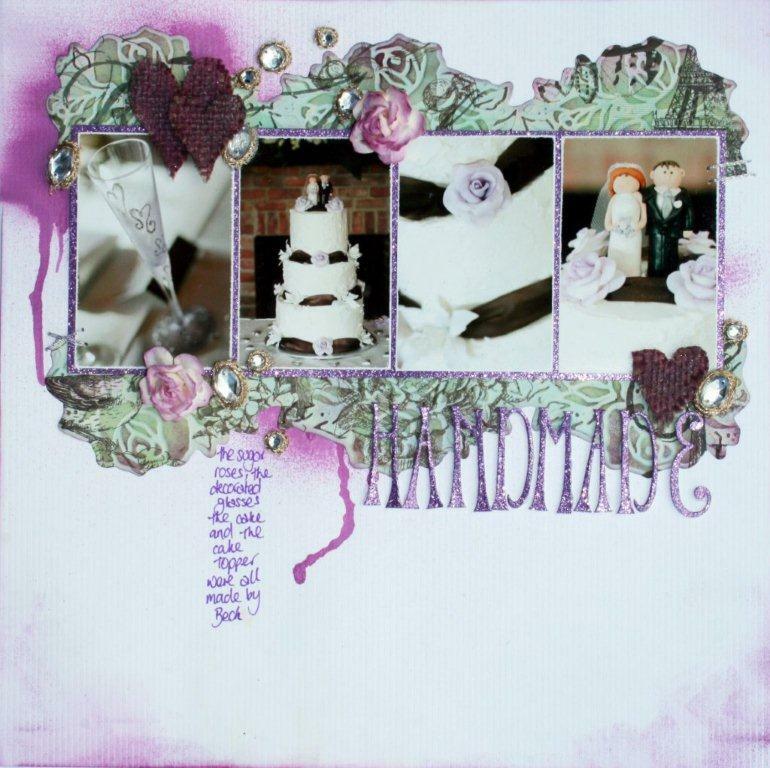 This of course included some wonderful Prima product, Scrapware Chipboard and Helmar Glue. With those three, you really can't go wrong! This is the layout I came up with (probably about 4 months ago now!) and finally get a chance to share it. We had fun adding a shabby chic feel to the embellishments with the help of some cream paint, as well as playing with texture paste on the chipboard wings. 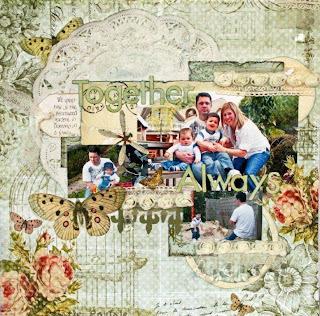 This range of Prima papers has been one of my favourites and I just loved working with it.